Grape phenolic compounds are located in the internal layers of grape skins and seeds. They are synthesized via the phenyl-propanoid biosynthetic pathway which is modulated by both biotic and abiotic factors. Considerable research has been conducted to clarify the evolution pattern of grape phenolic compounds and the role of environmental and viticultural factors that can manipulate their levels at harvest. The accumulation of phenolic compounds in grapes may be influenced by grape variety, environmental conditions and viticultural practices. 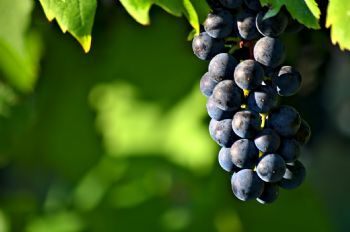 More notably, the influence of irrigation on the accumulation of anthocyanins in grapes has been treated by several authors reporting an overall positive impact of mild water deficit, attributed to changes in berry skin-to-pulp ratio, modifications in grape microclimate or differences in the partitioning of assimilates among vine organs. Moreover, light environment of the grapes, as affected directly by leaf removal, is reported to modify skin anthocyanin content, profile and extractability. However, under hot climate conditions, increased temperatures of exposed berries may hasten phenolic ripening and decouple skin and seed sensory traits. Concerning berry tannins, reports on the effects of environmental and viticultural conditions are fewer and inconsistent. Moreover, there is limited information available concerning the effects of environmental and viticultural conditions on the structural characteristics of grape proanthocyanidins, such as polymerization, galloylation and subunit composition, which define wine sensory properties. Keywords: grapevine, anthocyanins, tannins, flavan-3-ols, astringency, bitterness, polymerization, irrigation, microclimate. Paper presented at the XI International Terroir Congress, July 2016, McMinnville, Oregon (USA).